Retaining walls are added to properties to maximise usable space or to create visual interest in a bland flat garden. Regardless of whether the retaining wall is designed for aesthetic or practical purposes, it is important to design and construct it well so that it can serve either purpose. Where retaining walls are concerned, good design really begins below the ground and behind the wall. Projex Group lists out a few critical elements to consider before embarking on a retaining wall project. Retaining walls hold off soil when there is a drastic change in elevation. 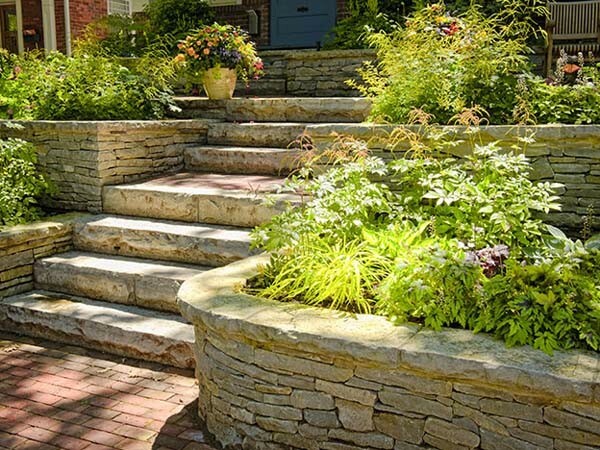 Typically built on steep sites to create safe, usable space for gardens, buildings, and driveways, retaining walls are also preferred by many homeowners to section off different areas of the garden for functional and aesthetic reasons. Retaining walls that are less than a metre high can be a DIY project. For anything above this height, Projex Group recommends that professional advice should be sought before building the wall. Poorly built retaining walls can bulge, crack, or lean and become an eyesore. In more serious cases they can also topple, making them potentially hazardous to passers-by. Considering this risk, local councils may require a formal approval before a retaining wall is built. If building close to a boundary line, please consult with the neighbours. Check your plans against plumbing and electrical diagrams before you start digging to avoid nasty surprises. A well designed retaining wall will meet both functional and aesthetic objectives of the project. Good design will not only prevent the wall tipping over but will also support the earth behind it and any load that may be applied, such as that from cars and buildings. It will also prevent water build-up behind the wall that could otherwise increase the lateral load on the wall. Gravity walls, usually made of stone or concrete, rely on their mass to withstand the lateral pressure of the soil behind them. Cantilever walls are stabilised by their footings or vertical poles in the ground, and rely on the strength of their construction materials. A solid retaining wall starts below ground level with a good base consisting of compacted soil and at least 150mm of compacted sand and gravel. The compacted base ensures that the base course of the wall remains flat, which in turn ensures that the timber, blocks, and stones used to construct the wall, will have more contact with the courses above them. More contact increases friction and contributes to a stronger wall. If you are planning a high retaining wall, dig deep. A good rule of thumb is to have one tenth of the height of the wall below ground level. A 900mm high wall should have a base course at least 90mm below ground level. Posts for cantilevered walls should be 100mm below ground level for every 100mm of the wall height. Also remember to dig back another 300mm behind the wall for gravel backfill. Use gravity to your advantage by stepping the wall back towards the soil. Effective drainage is critical for successful retaining walls. Without effective drainage, pressure builds up behind the wall and creates bulging or cracking. Three effective ways of ensuring good drainage for the wall include gravel backfilling, installing perforated pipes with drainage cloth that feeds into a stormwater drain, and providing weep holes for water to drain out from behind the wall. Retaining walls look as if they have to hold back great masses of earth, but they only have to hold back a small wedge. Fill this wedge with sandy, gravelly materials that compact easily and allow water to drain down and away from the wall. Compacting the backfill during the process directs pressure downward rather than against the wall. For proper drainage you need at least 300mm of gravel or similar material directly behind the wall. If you’re planning on landscaping behind the wall, allow for at least 150mm of topsoil above the gravel. Providing adequate drainage isn’t enough to prevent water from migrating through a retaining wall. Retaining walls also need waterproofing treatments to reduce the build-up of hydrostatic pressure on the wall and to protect it from ground dampness. Water in the wall can create a host of problems including corroding steel supporting rods, which can then expand and crack the concrete. Waterproofing also protects the wall from the water migrating through the drainage system and seeping into the wall. Two waterproofing membranes that can be used for retaining walls are Cosmofin and Wolfin from Projex Group. When applying the waterproofing membrane, ensure there are no seams to allow water to penetrate into the wall, and that it extends below the perforated pipe to the base of the wall.